Thaler has made a career of studying irrational and temptation-driven economic behaviors. The current bull market is the second longest in modern history. If it manages to last until August 22, it will become the longest running bull market, at 9½ years. No bull market has ever made it to its 10th birthday. What Happens When a Bull Market Ends? Historically, the longest-running bull markets go out “with a bang, not a whimper,” according to investment strategist Sam Stovall. The only bull market since 1950 that’s lasted longer than the current one was the dot-com-fueled rally of the 1990s, before spectacularly flaming out. When bull markets end, it causes almost unimaginable pain for people, as they lose jobs, homes, their life savings, and sometimes their marriages. It has taken up to 25 years to recover from a major market crash. It seems as though many people have forgotten the lessons learned in the last two market crashes, that each wiped out 50% or more of the typical investor’s hard-earned savings. And that’s twice just since the year 2000. As Nobel Prize winner Thaler and other behavioral finance experts note, we humans are hardwired to conform to what everyone else is doing, which is why people get shorn like sheep by Wall Street again and again. “Everybody else is doing it” should never be your reason for doing anything. The fact that everybody is doing something is more likely a good reason not to do it. Most of the time, the idea that everybody else is doing it is an illusion, not reality, anyway. No matter how you look at it, the current bull market is highly unlikely to last longer than one more year – and for it to last another full year would require a situation that’s never happened before. Given the length of the current bull market, it’s likely to end with a spectacular crash. If you don’t have a significant portion of your savings in safe and liquid financial vehicles, you are in for some serious pain that could last for many years or even decades. 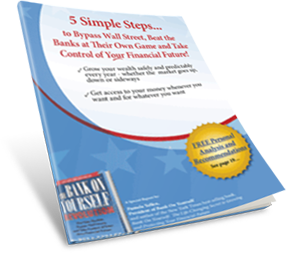 It’s easy to find out what your bottom-line numbers and results could be if you added the Bank On Yourself safe wealth-building method to your financial plan. Just request your free, no-obligation Analysis here, if you haven’t already. While current tax law appears to favor the Bank on Yourself approach, what does the current House proposed bill do to insurance-advantaged ideas? Until a law is actually finalized, we can’t speculate on the unknown. How is this different from from the (you become the bank,) with Patrick Donahue? 1. Bank On Yourself Authorized Advisors undergo rigorous advanced training and certification and have continuing education requirements. 2. They work under the guidance and supervision of Bank On Yourself policy-design specialists who have each designed over 2,000 of these policies. 3. They use companies that are among the ten financially strongest life insurance groups in the world. A free, no-obligation Analysis will show you the bottom line results you could get with a custom-tailored plan. You can get a referral to a Bank On Yourself Authorized Advisor here.